Ashwin Pimpalwar, MD, Saif Hassan, MD. Michael E DeBakey department of surgery, division of Pediatric surgery, Baylor college of medicine, Texas Children’s Hospital, Houston, Texas. Our modified LEGT technique has the cumulative advantage of all the other described techniques but does not share any of their complications. We report early results of our modified LEGT technique. Material: 26 children from May2008 to Feb2010. Age range 2months to 16years. Average operative time was 42min. Technique: Under GA, a gastroscope was placed in the stomach and laparoscopic visualization was obtained through a 5-mm umbilical port. 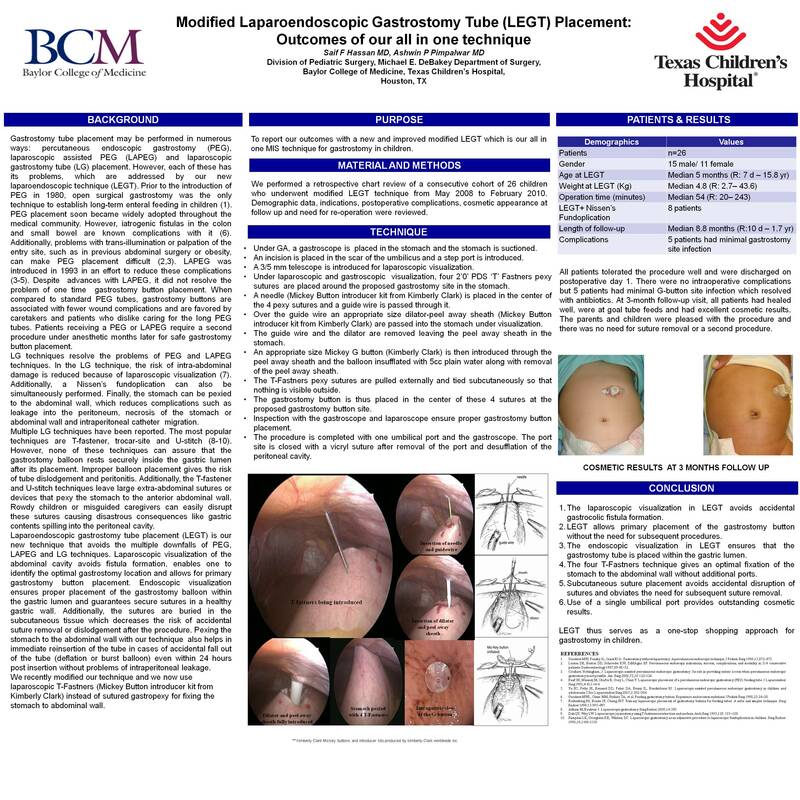 Using laparoscopic and gastroscopic visualization, four 2’0′ PDS ‘T’ Fastners were placed around a proposed gastrostomy site in the stomach. These sutures were pulled externally and tied subcutaneously so that nothing was visible outside. The gastrostomy button was then placed in the center of these 4 sutures at the proposed gastrostomy button site. Once the gastrostomy balloon was inflated, the 4 sutures were pulled taught and tied subcutaneously to pexy the stomach to the abdominal wall. Inspection with the gastroscope and laparoscope ensured proper gastrostomy button placement. Results: At a median follow-up of 13months none had major complications, 5 patients had minimal site infection. Conclusions: The laparoscopic visualization of the LEGT avoids accidental gastrocolic fistula formation and allows primary placement of the gastrostomy button without need for subsequent procedures. LEGT ensures the G-button, is placed within the gastric lumen. Additionally, the 4 ‘T – Fastner technique gives an optimal fixation of the stomach to the abdominal wall, gives outstanding cosmetic results, avoids accidental disruption of sutures, and has no need for suture removal at a postoperative visit as in other techniques.